My 7 year old, 106 pound lab/chow was having difficulty getting up off the floor, he would move slowly and you could see he was having a rough time. started this supplement twice daily, and about 3 weeks later....he started running, jumping, and acting like a puppy again!! our other 2 puppies didnt know what got into him!! He is back to his youth...he pulls on walks like he used to, he doesnt tire out as easily...these supplements are AMAZING!! and since he has been pain free, he has been able to exercise and has lost over 13 pounds!! I checked with our vet before starting him on them, and she approved. HIGHLY recommended!! will continue to buy these!!! My dog is a 14 year old dachshund/black lab mix with obvious back and rear leg pain. I was having to walk her around the house to the back yard, because she could not stop her self on the stairs going downstairs to the backyard. It was okay during the summer, but winters in Wyoming can be rough and I didn't want to have to do the trip with her in deep snow. I ordered the Dog Arthritis and in a very short time, she began to stop dancing from foot to foot (r/t to discomfort) and upon testing was and able and continues to be able to do the stairs without crash landing. I am very pleased with this product. What a difference these tablets have made! My bulldog was only a year old and having issues with his back leg. He loved leaping up to catch frisbees! But it was 50/50 that he'd be limping by the end of the day. HUGE difference since he started taking these tablets!! He's nearly 60lbs and takes one a day. It's enough. He hasn't limped in over a month after playtime.... Or any time. He's actually leaping even higher now without showing any signs of joint pain. Highly recommend these for any dog with joint issues. I love this product. My dog is 9 years old and has arthritis. She used to walk real slow and could never jump. She could not really play with the other dogs. I bought this product based on reviews and because the expensive stuff from the vet was not working. I noticed a big change in about two weeks of taking it. She now runs, jumps and plays with the other dogs. She does not act like a 9 year old she acts like a 6 month old puppy. I'm so happy this product worked for her. I have been purchasing this item for my niece's 15 yr old large breed dog who naturally has arthritis. They saw results within weeks in increased strength and agility. He has spent the summer swimming daily, has lost a few pounds and seems like a younger dog. I have a 12 year old Golden Retriever who is over weight with arthritis in his hips. He takes this along with Dermamaxx which seems to help him a lot. I noticed a difference when I ran out of this for a few days. He really struggled to stand up and I felt so guilty for running out. Never again. These made such a huge difference in my Alaskan Malamute's overall temperament. He was so stiff that he used to not even get as excited for his walks anymore (which is a huge deal) & after taking these a few days he was nearly acting like a puppy again--it's been great--except that's he's back to walking me. ;) Also, although my dog may be the exception to this, I don't have to grind these up or mix with wet food; I just toss them in with his dry food & he eats them whole. Great product--just bought my second bottle & I'm sure I'll be back for more! Easy to get my dog to swallow and she isn't limping like she used to. We were able to go for a short walk which she hasn't been able to do for a while.. Thank you.. 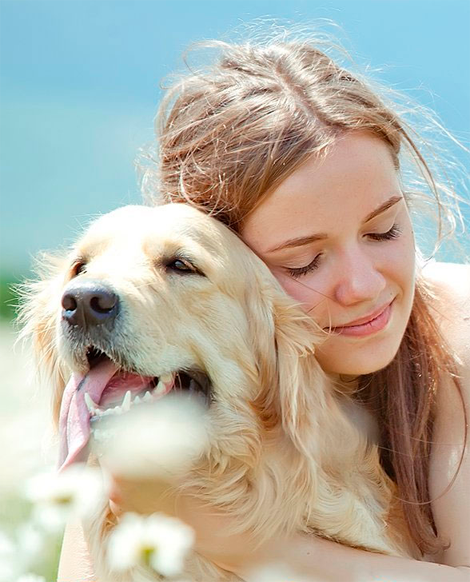 Bet on Dog Suplements for Joints and Relieve Arthritis Pain in 30 Days Or Less - Guaranteed! Contains Glucosamine and Chondroitin, which are found in healthy cartilage, plus manganese, which helps in the formation of cartilage, to aid and support the overall health and mobility of joints in pets! This dog supplement for joints also contains Organic Turmeric, which has multiple health benefits, including the ability to act as a natural anti-inflammatory agent, reducing your dog’s hip and joint pain. I like the benefits this product gives to our little furry ones. It relieves pain and they must taste great cause i have no problem getting him to take them. Great product. Give your dog the pain-free life he/she deserves with Top Dog Premium HIp & Joint Complex with Organic Turmeric. Used as a supplement to your dog’s diet, this Premium Help & Joint Complex with Organic Turmeric. Used as a supplement to your dog’s diet, this Premium HIp & Joint Complex aids in decreasing and improving your dog’s ability to repair and strengthen tissues. In younger dogs, Top Dog Premium Hip & Joint Complex assits with the maintenance of healthy joints and cartilage. 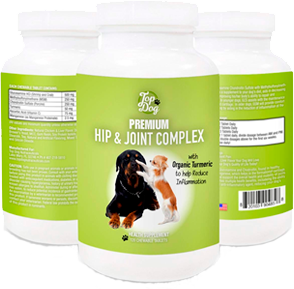 In older dogs, Top Dog Premium Hip & Joint Complex provides confort and relief to your dog by aiding in the reduction of inflammation at the nerve endings. Glucosamine and Chondroitin, found in healthy cartilage, plus manganese, which helps in the formation of cartilage are used to aid and support the overall health and mobility of joins in pets. Organic Turmeric has multiple health benefits, influcing the ability to act as a natural anti-inflammatory agent, reducing your dog’s hip and joint pain. "A percentage of profits from every bottle sold will be donated to local dog rescue organizations nationwide"
If not, you get your money back!